Editing portraits can be tough, especially when you have a client or a manager reviewing your work. 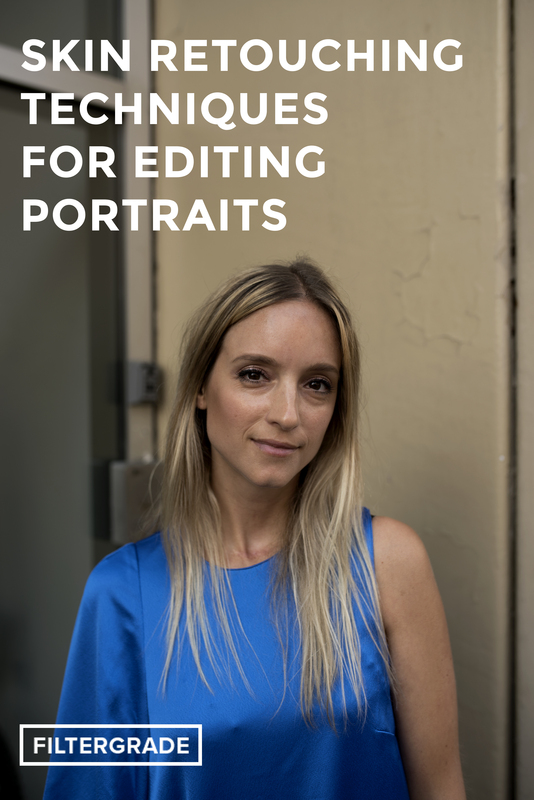 But that shouldn’t make you afraid of editing portraits, that should make you even hungrier to create the best edits and capture the best tones so your subjects look perfect. We’re going to be going over a few different techniques on skin smoothing and portrait retouching to help you learn how to best edit your portrait photos. Along with this, we’ll also share some of the best presets and brushes to help you in your editing process! If you’ve never installed presets before, there’s no need to worry! 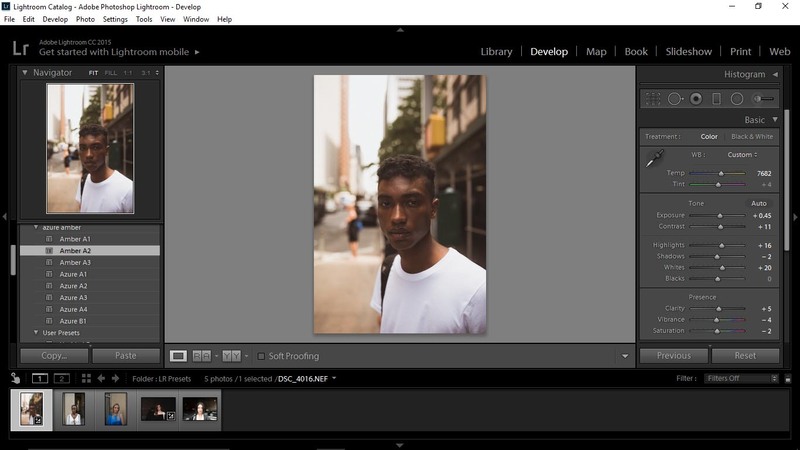 Check out our tutorial on How to Install Lightroom Presets here. Once you’ve got your photos and you’re ready to start, open up Lightroom and get ready to dive in. Let’s start with some presets that will give your overall photo a “feel” or vibe with color, adding mood and visual interest. These presets are for when you tried to capture a certain mood, but the lighting wasn’t perfect or it may have looked faded. Another thing to remember is that a portrait isn’t just a picture of a person, but the place they’re in and the vibe they’re giving off. These presets are just for that. Matt Larson’s Lightroom Presets are a must for someone who does a lot of traveling and doesn’t have the time or patience to constantly fumble with settings on a camera. 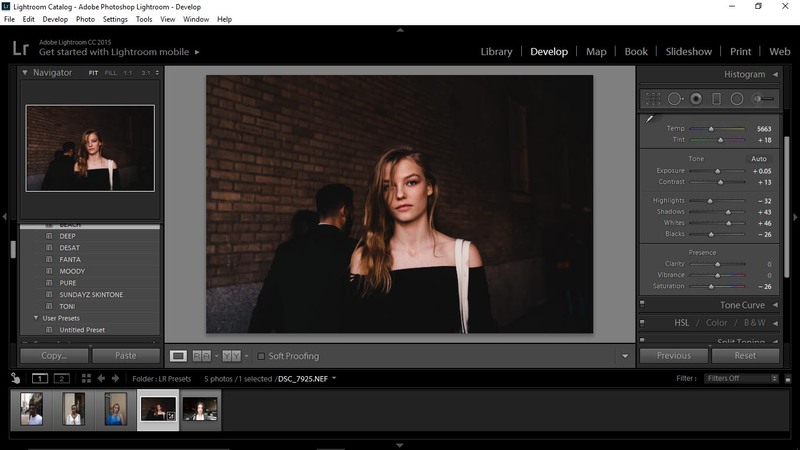 These presets can also work if you’re working with a point and shoot or a cellphone camera to make all your images look professional. These tropical presets can take a simple snapshot and give it a mood and a feel without you having to do much more than load the preset filters. They can take dull and bland colors and give the photograph a real pop, making your portrait evoke an emotion rather than just capturing a subject. Remember, these presets aren’t just for one photo, either, but the whole set. Here are some examples. Another bundle that is great for enhancing your portraits is the Azure and Amber Tones package. The Amber presets have a warmth to them that makes each photo look like it was taken right at Golden Hour, so they’re great for adding a natural glow. The Azure pack emphasizes skin tone and gives the photo a moody feel with soft colors and cool highlights. This is one of the best preset collections to have ready to go when it comes to wedding, engagement, or baby photos because regardless of when you get a chance to shoot them, you can make every photo look romantic and perfect. The best part is that you can go warm or cool! 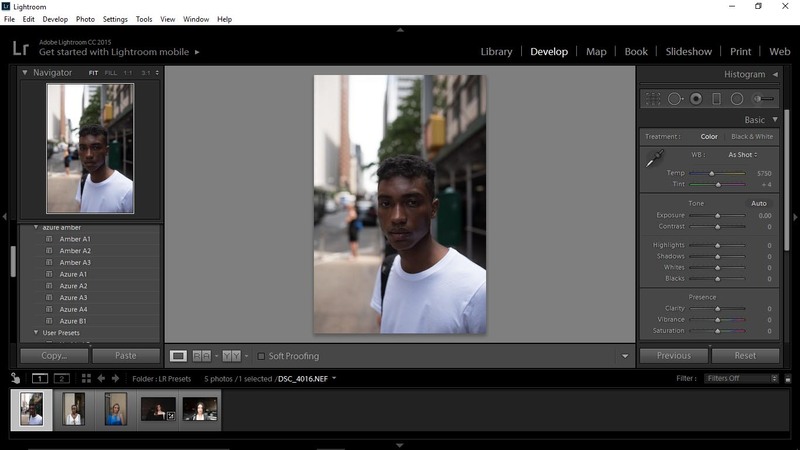 The next style of editing we’re going to talk about is for portraits and skin smoothing. If you’re planning to be a professional photographer or even if you just take portraits of your friends and family, you need one good skin retouching brush. Even if you think someone’s skin looks acceptable, a client will notice any bump or blemish. They might even find flaws you never knew about. You can get around this by retouching your images. Of course you know that retouching skin isn’t as easy as just putting a filter over the entire photograph; there are a few steps to keeping skin looking the best and the most natural. First, you want to start with retouching obvious blemishes. 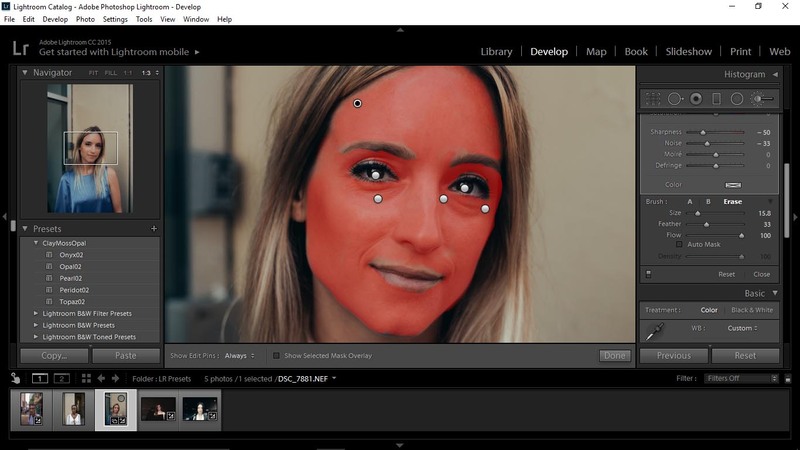 Lightroom will automatically pick a skin color to sample from, but you can easily change that by moving the sample circle to the spot you want, and then covering over those little blips in skin tone. After all obvious blemishes are gone, you want to step back and take a look at what else can be retouched. If you haven’t already, you should make your tone and contrast adjustments before continuing so that you have everything but skin handled. Once these little edits have been made, you may see more places that you want to edit or places that you thought were an issue turn out not to be once you’ve adjusted your settings. The next place to edit is underneath the subject’s eyes. There can be dark patches, wrinkles, and defined creases that many clients are concerned with concealing. Don’t go too far in the editing direction, either. Unless you’re looking for an airbrushed, heavily-retouched look, then you only want to minimize things like dark circles; you don’t want to remove them completely. Your portrait still needs to look natural and as similar to the person in real life as possible. At this point, depending on the light in your picture, you may want to enhance the eyes by brightening colors or even adding highlights. You have to be careful about this effect because it can easily look unnatural (think every movie with a blue-eyed male protagonist). There’s no harm in adding a little punch to eyecolor, just be very careful. Finally, you want to apply gentle skin smoothing to the entire face. This is when the presets really come in useful. The process is really simple, too. You’re going to use your preset brush to paint the entire face and then use your eraser to go back and erase the eyebrows, eyes, and mouth. At this point you can play with how strong you want the skin smoothing effects to be. 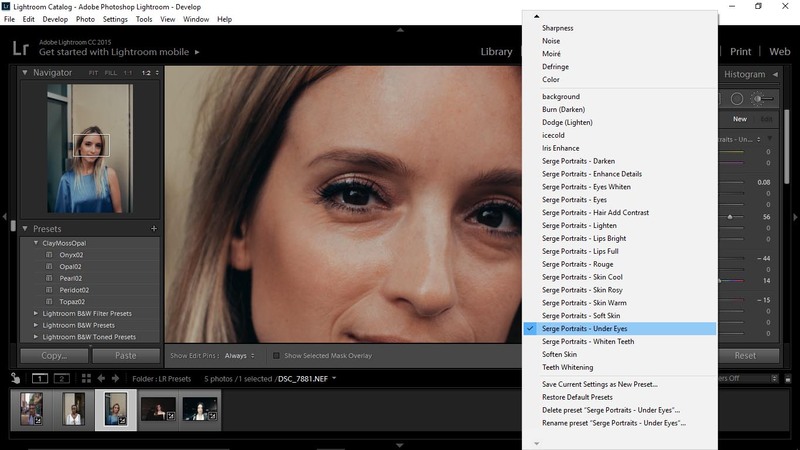 You can set the preset at maximum so the subject’s skin looks airbrushed to perfection, or you can have it a little more subtle and let some of the natural skin texture show through. Let’s walk through one together. 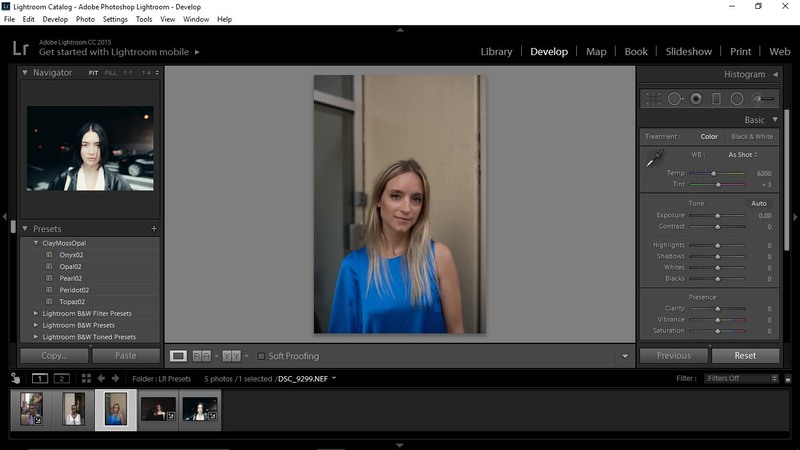 For this walk-through, I am going to be using the Clay-Moss-Opal Preset Package and the Photoserge Preset Package. 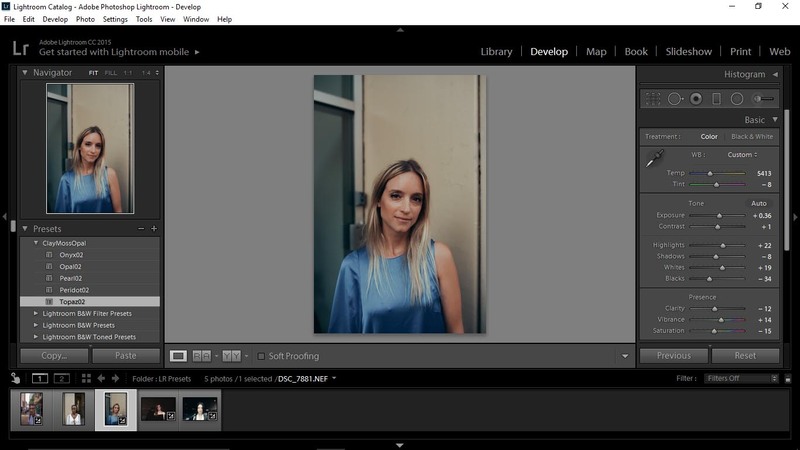 Both packages contain several presets to further enhance your photograph; however, the Photoserge package also contains brushes to do more specific retouching on portraits. Let’s start with a basic portrait photograph. Before changing anything else, I’m going to start playing with my color presets because, for me, that’s the most fun. Starting with your color and tone presets can give you a direction of where to go with your photography and give you an overall look to shoot for. After that, you can take care of details like under eye circles or blemishes. First, I adjusted the exposure and contrast to give more drama, and then on top of that I added the Topaz02 preset from the Clay-Moss-Opal package to tone those color. This gave the colors some pop, and I am satisfied with the fact that her skin and the background no longer look the same color. Now let’s start into the skin retouching. First I am going to look for any blemishes and correct those. For this part, we’re going to be using the spot removal option. This option is beside the grid on the right side of your work station. 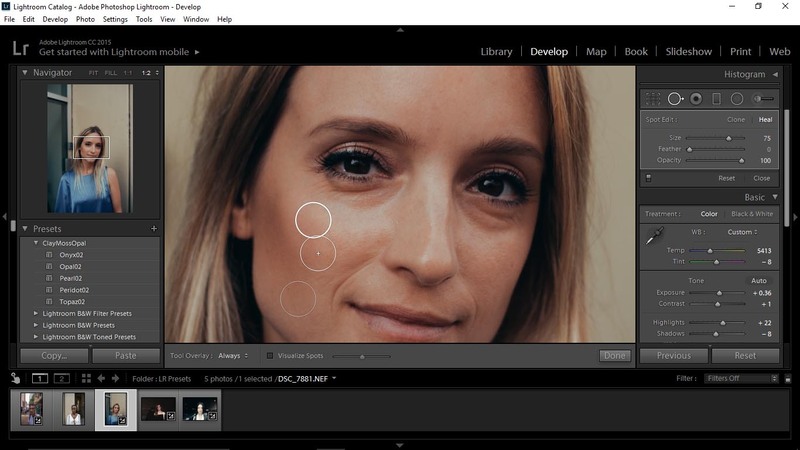 When you select a spot for removal, you will see Lightroom work to find the best skin match to replace the blemish with. Usually Lightroom is spot on, but if you can adjust the grab if you don’t like the spot chosen. Now, since I’ve already adjusted the exposure and contrast, I am going to start adjusting the area under my subject’s eyes. I also want to enhance her eyes since because of the filter, they look even darker than they did before. I’m going to select the eyes brush from my brush menu and just focus in on the pupils. And last, now I’m going to go over the entire face with the “Soft Skin” brush. This brush just evens out the entire face. When you’re covering the face, you want to avoid the eyebrows, eyes, and lips. At this point, I will do another round of tweaking to make sure it looks better than the original but still natural. In what order should I use my presets? In my example, I added a preset over the entire photos before starting the skin retouching. You can mix and match presets and skin-retouching packages. Say for instance you want your photograph to have warm, sunset tones. 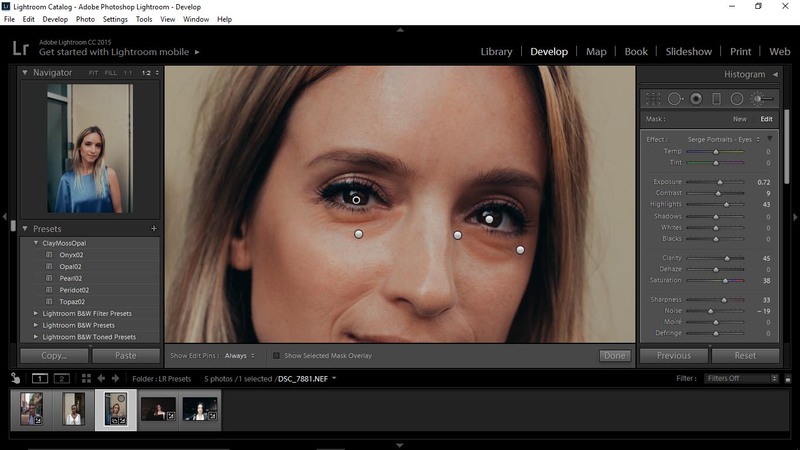 You apply your preset and do all of your small adjustments before you start with the skin retouching. Doing it this way will allow you to properly pick a focus for the piece and will answer questions like: How smooth should the skin be? Should you enhance the eyes? How much retouching is truly needed to make this client and this photograph look their best? The glory of these presets is that you can do both skin retouching and general color adjustment. Mixing and matching your presets gives you the freedom to perfect everything about a photo, not just use airbrushing on their face and call it a day. So the next time you’re shooting a wedding, a baby shower, or any kind of portrait, you have the peace of mind that you can make them all flawless without taking weeks.